This vibrant red beet soup is packed full of nutritious whole plant foods and cooked with flavorful mustard and a splash of balsamic vinegar. The beets are peeled and become very sweet when cooked, so there's no earthy taste here! Just sweet, tangy, wholesome goodness. This soup contains a variety of some of the healthiest whole plant foods possible, including beets, potatoes, carrots, purple cabbage, leeks, garlic, and fresh herbs. Despite this soup being such a healthy meal, you wouldn't guess that from the way it tastes. It's lightly sweet from the beets and gets a delicious tangy flavor from the balsamic vinegar which is added in at the very end. This recipe is fairly easy, but be warned- there's a lot to chop! Sometimes it helps to put on a podcast to listen to in the background, but lately I try to use the time spent chopping as an opportunity to tune in and be more present with what I'm doing. It's a great time to slow down and feel grounded while preparing myself a truly nourishing meal. 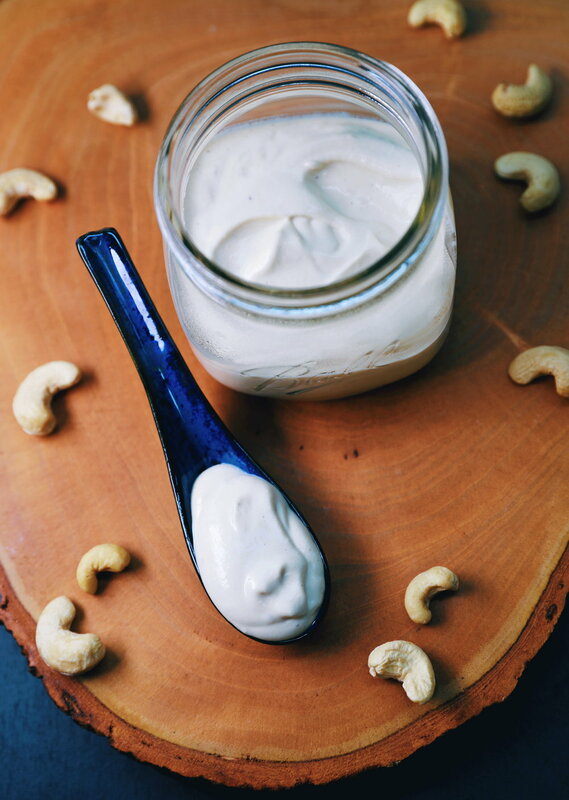 Once everything is chopped and the cooking has commenced, I like to whip up a quick cashew sour cream. 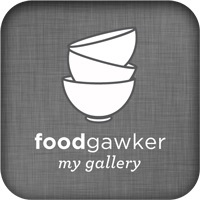 My favorite vegan sour cream recipe is this recipe by Hot For Food. While this soup is fantastic with or without sour cream, it's so easy to make that I usually find it worth the small amount of effort. 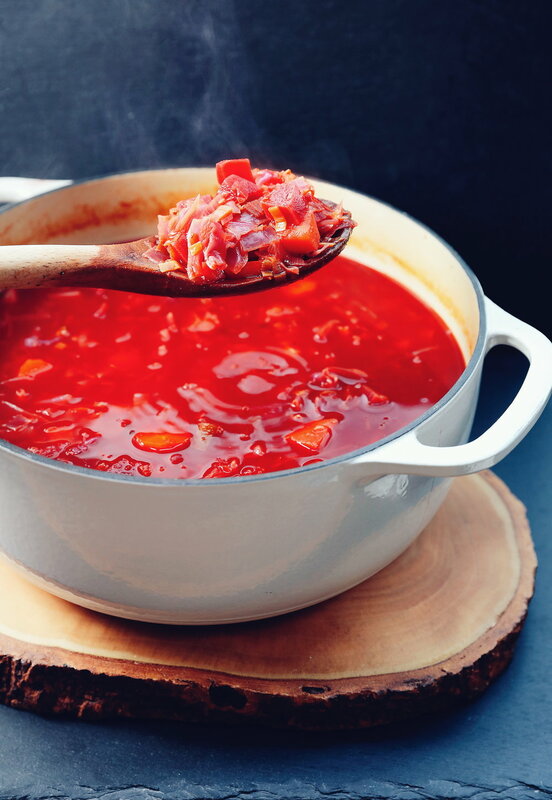 If you've been following my blog since the beginning, you may remember that one of my very first recipes was a for a borscht soup! Since then, my recipe has changed a bit with the addition of the balsamic vinegar and getting really specific on the exact measurements after making this countless more times since then. Over the years this has become one of my all-time favorite recipes and one that I've been really excited to update and share with you so that you can try it out for yourself. As good as it tastes, the way it makes you feel is the best part! I hope you enjoy the recipe, and if you do feel free to let me know what you think of it by leaving a comment down below. Vegan Tacos with Purple Cabbage Slaw + How to Make Your Own Tortillas! These tacos are crunchy, savory, and so satisfying! They'll change the way you see cabbage slaw forever. I've been trying to find a way to work purple cabbage into a taco recipe for a while and every time it still tasted a bit like... cabbage. This time, I made a marinade with a little tahini, vinegar, and maple syrup and cabbage has never been so delicious! Along with the cabbage slaw I made an easy version of guacamole and an equally easy vegan sour cream made from plain unsweetened coconut yogurt. I'm also working on a recipe for a low-fat sweet potato nacho cheeze sauce which will be in an upcoming free ebook! The combination of beans with crunchy cabbage, vegan sour cream, and guacamole is so delicious! Once the cabbage slaw was done, I started making the tortillas. Did you know you can make your own 3-ingredient tortillas at home and that it's actually way easier than you'd think? All you need is something called masa harina, which is made from dried corn and has been cooked in water with lime which gives it its flavor. Add hot water to masa flour and stir to form dough. Separate the dough into 6 pieces (1.5 inches in diameter) and roll into balls. Line tortilla press with 2 pieces of plastic (I used a ziplock bag cut into 2 pieces). Place one ball in the center of your tortilla press and slowly close the lid to flatten. Repeat with remaining dough balls. If you don't have a tortilla press, you can flatten them by hand, which can be kind of fun too! Though it does take a bit more time. Once you have your flattened dough, place each tortilla in a pan and heat for 2 minutes on each side until golden brown. Then fill each tortilla with beans, cabbage slaw, guacamole, and vegan sour cream. Additional topping options: hot sauce, hot peppers, pico de gallo, marinated jackfruit in place of the beans, grilled zucchini or bell peppers.